The HRT (horizontal return tube) boiler design has been around for many years and has proven to be one of the most durable solid fuel boilers ever built. This design has been installed in industrial applications for over 100 years. Moss can supply this boiler ranging in size from 150 - 1,160 HP and design pressures from 15 - 250 PSIG. This design incorporates a large furnace and rear turnaround zone that is very conservatively designed. Structural steel beams hold the pressure vessel in suspension while the furnace is built around the boiler. The large steam storage and disengaging area in the firetube boiler helps prevent drops in steam pressure and water carryover to the process. 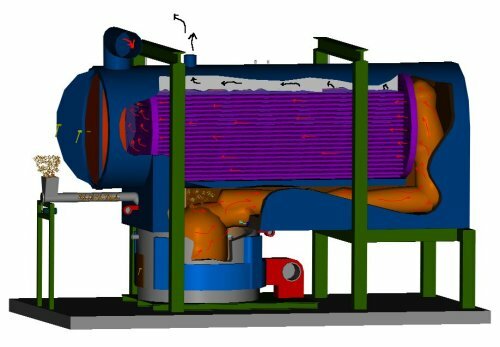 An automatic sootblower system is available as optional equipment and is strongly recommended for extended runtime between boiler tube cleanouts. The HRT boiler can be supplied with either a Moss gasifier or pneumatic combustion system.